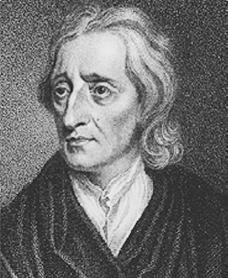 The English philosopher and political theorist (a person who forms an explanation based upon studying and observing politics and politicians) John Locke began the empiricist tradition (the source of knowledge comes from experience and the senses) and thus started the greatest age of British philosophy (the study of knowledge). He attempted to center philosophy based on the study of importance and capabilities of the human mind. John Locke was born on August 29, 1632, in Wrington, in Somerset, England, to Agnes Keene and John Locke, the elder. His mother died during his infancy, and Locke and his only brother, Thomas, were raised by their father, who was an attorney in the small town of Pensford near Bristol, England. John was tutored at home because of his delicate health and the outbreak of civil war in 1642. When he was fourteen, he entered Westminster School, where he remained for six years. He then went to Christ Church, Oxford. In 1658 he was elected a senior student at his college. As such he taught Greek and moral philosophy. In order to continue his work at the school he would have to have been ordained (officially consecrated) a minister. Instead he changed to another study, medicine, and eventually received a license to practice. During the same period Locke met Robert Boyle (1627–1691), the distinguished scientist and one of the founders of the Royal Society, and, under Boyle's direction, took up study of natural science. Finally, in 1668, Locke was made a member of the Royal Society. In 1665 Locke traveled to Europe as secretary to the English ambassador to the Brandenburg court. Upon his return to England he happened to medically treat Lord Ashley, Earl of Shaftesbury, and later lord chancellor of England. Their friendship and lifelong association drew Locke into political affairs. He attended Shaftesbury as physician and adviser, and Locke drafted The Fundamental Constitutions of Carolina and served as secretary to the Board of Trade. In 1676 Locke went to France for his health. An inheritance from his father made him financially independent, and he remained in Montpellier for three years. Locke rejoined Shaftesbury's service, and when Lord Ashley fled to Holland, he followed. He remained in exile from 1683 to 1689. Most of his important writings were composed during this period. After the Glorious Revolution of 1688 (a revolution that overthrew King James II [1633–1701]) Locke returned to England and later served as a commissioner of trade until 1700. He spent his retirement at Oates, in Essex, and died there on October 28, 1704.
he brought out his major works: Two Treatises and the Essay Concerning Human Understanding. The four books of the Essay were the result of twenty years of intellectual work. The aim of this work was "to inquire into the origin, certainty, and extent of human knowledge, together with the grounds of belief, opinion, and assent." The procedure used was what Locke called the "historical, plain method," which consists of observations of external (outside of a person's body) sensations and the internal (within a person's mind) processes of thinking. This psychological definition of experience as sensation and reflection shifted the focus of philosophy from an analysis of reality to an exploration of the mind. The new perspective was Locke's major contribution, and it dominated European thought for at least two centuries. Locke devoted the first two books of the Essay to developing a seemingly simple empirical theory of knowledge. Knowledge begins in the external and internal sources of sensation (use of the five senses) and careful thinking. The conclusion drawn in the Essay was that knowledge is relational; that is, it consists in the understanding "of the agreement or disagreement among ideas." The third book of the Essay deals with words, and it was a pioneering contribution to the philosophy of language. Locke was a consistent nominalist in that for him language was a custom that was subject to judgement and words were things which "stand for nothing but the ideas in the mind of the man that has them." The final section of the Essay deals with the sections of knowledge. In this view, with the exception of the self and God, all knowledge of existing things is dependent upon sensation. The shortage of real knowledge is fulfilled to some extent by human judgment, which assumes things to be true without actually being aware of the connections. And, according to Locke's commonsense attitude, the major limitations placed upon knowledge reflect that man's mental capacity is appropriate for his character and situation. Cope, Kevin Lee. John Locke Revisited. New York: Twayne, 1999. Cranston, Maurice. John Locke: A Biography. London: Longmans, 1957. Romanell, Patrick. John Locke and Medicine: A New Key to Locke. Buffalo, NY: Prometheus Books, 1984.